A princess needs her own special pony, and our 27 inch Inflatable Pony comes in pastel colors that every little girl will love. Imagine how happy she'll be when she finds this adorable inflatable pony in attendance at the party. The best fairy tales always have a prince and a horse, and you're definitely going to need a pony or two for your little guests to enjoy. If you're not having a party, no problem! These ponies are cute enough to decorate any child's room. 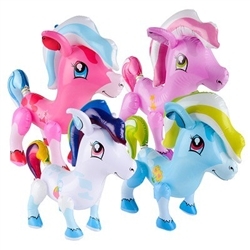 Even though these inflatable ponies don't possess any special powers or magic, they'll be certain to put a smile on the face of whomever receives one. Check out our princess party decorations here.